Karl Deisseroth, the D. H. Chen Professor of Bioengineering and of Psychiatry and Behavioral Sciences at Stanford University visited the National Centre for Biological Sciences (NCBS), Bangalore, while he was in the city as the featured speaker for the Cell Press-TNQ India Distinguished Lectureship Series 2016. 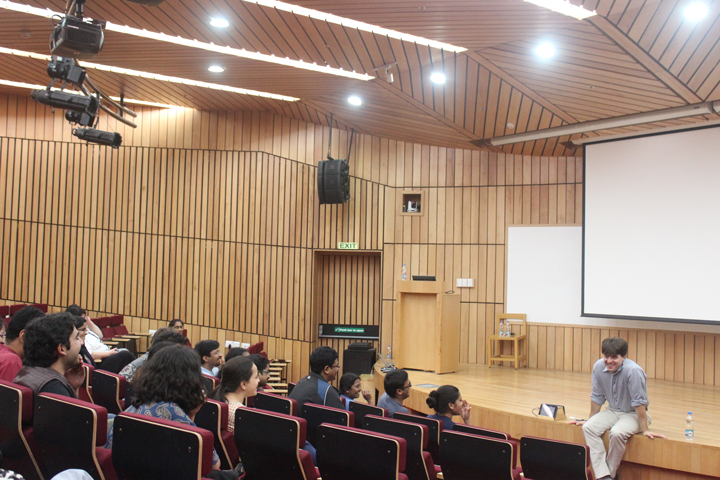 While at NCBS, he gave a fascinating talk on the development of molecular and optical tools as drivers of new discoveries in neuroscience. The talk also marked the first in a series of lectures and events planned for a celebration of 25 years of NCBS. A practicing neuropsychiatrist, bioengineer, and behavioural scientist all rolled into one, Karl Deisseroth has pioneered techniques that have revolutionised the field of neurobiology - namely optogenetics and CLARITY (Clear Lipid-exchanged Anatomically Rigid Imaging / Immunostaining-compatible Tissue hYdrogel). Optogenetics is a technique that integrates optical and genetic techniques to create neurons expressing light-sensitive ion channels. These neurons can then be turned on or off using light, allowing the mapping of neural networks to study the normal and dysfunctional properties of neuronal circuitry. The CLARITY technique, most recently developed from Deisseroth's laboratory in Stanford University can render tissues - even whole brains - transparent while leaving cells and their connections intact, permitting an unprecedented view into the complex networks that make up the brain. Deisseroth's talk at NCBS offered the scientific community a glimpse of the challenges that motivate him and his team to develop newer and more sophisticated techniques to literally illuminate the brain through optogenetics. The optogenetic methods developed by his group have influenced the study of neural circuits and behaviour in organisms as varied as mice, rats and fruit flies. Diverse topics such as protein bioengineering, behavioural assays and the development of systems for photometry and imaging were merged under a banner for creating better tools with which to understand how the brain functions. "For a neuroscientist who has struggled with patch-clamping and worked with wire electrodes and glass capillaries to record electrical signals from brains, Karl Deisseroth's work opens up huge possibilities in terms of questions one can address in neurobiology", said Upinder Bhalla, the Dean of NCBS. The visit also included informal sessions of conversations with researchers at the NCBS campus. The Lecture Series is co-sponsored by Cell Press and TNQ Books and Journals. The lectures are annual events that aim to bring internationally renowned scientists to India with the objective of fuelling interactions between the Indian scientific community and other eminent scientists from across the world. The lectures are held in Bengaluru, Chennai, and New Delhi each year.